Unlock beautiful hair-free skin with nature’s biggest secret yet! 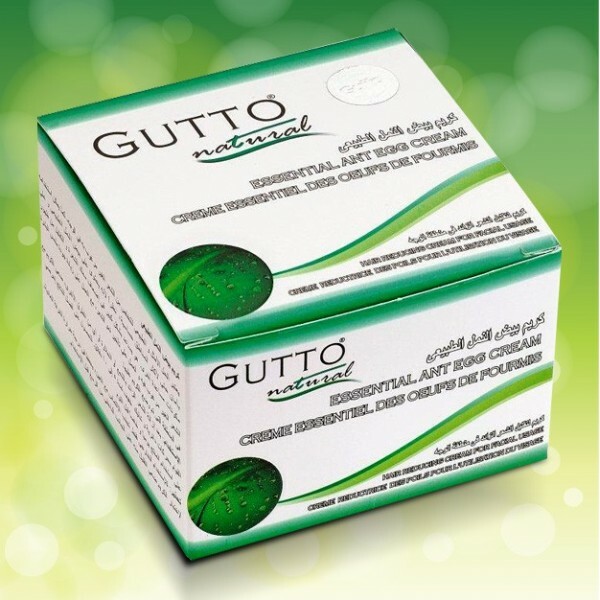 Used after epilation, Gutto Natural ‘ant eggs’ cream is an all-natural anti-regrowth formula. Penetrating deep into the hair roots, this cream makes new hair grow back thinner and lighter, gradually achieving permanent hair removal with regular use. Although there was a time when Middle Eastern women would massage real ant eggs into their skin to prevent hair regrowth, this cream does not contain ant eggs. The active ingredient is formic acid, an anti-regrowth substance which is also secreted by ants. With added aloe vera and allantoin, this ant eggs cream gently calms and moisturises the skin as it works, making it suitable for use on all parts of the face and body, including sensitive areas. Because this anti-regrowth formula gets to work deep down at the hair bulb, it is most effective after using wax, tweezers or the depil spring. For efficient results, ensure no shaving or depilation hair removal creams are used. Simply apply for 5 consecutive evenings after epilation. Results will be noticeable within 2-3 months of use. For easier absorption, try Gutto Natural’s ant eggs oil, for a lightweight, serum texture.